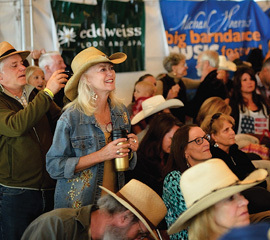 Michael Hearne’s Taos barn dance festival is a roundup of friends, family, and Southwestern Americana at its finest. The Bill Hearne Trio plays at La Fonda on the Plaza, Santa Fe, Mon. and Tues. nights, 7:30–11 p.m. (505-972-5511; billhearne.com). ALL MICHAEL HEARNE ever wanted to do was play guitar. So he quit high school in Dallas, hit the road in his uncle’s band, and landed in northern New Mexico at the end of the 1970s. In Red River and Taos, he became one of northern New Mexico’s favorite musical sons, and the wearer of many (cowboy) hats—bandleader, singer, songwriter, and guitarist par excellence. Each September, Michael rounds up top local musicians and invites his famous and semi-famous friends to join them in Taos for a three-day celebration of music that puts the Southwestern in Country & Western. 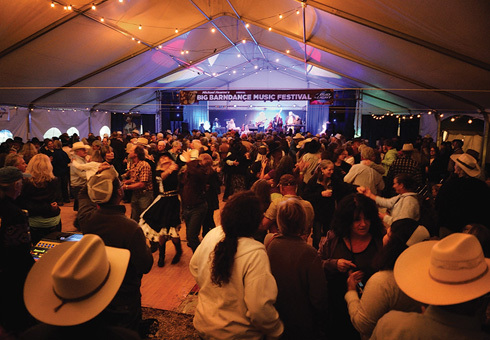 This year, Michael Hearne’s 13th Annual Big Barndance Music Festival sets up camp September 10–12 at Kit Carson Park in downtown Taos. Music runs in Hearne’s family. “I grew up in Dallas listening to my dad’s records—lots of Ian Tyson and Jerry Jeff Walker—and I used to listen to my uncle Bill play guitar.” Just six years older than Michael, Bill Hearne left Dallas in 1968 for the University of Texas at Austin, where he married the woman with whom he would launch a long-running career under the billing Bill and Bonnie Hearne. Their voices harmonized over her piano and his muscular acoustic guitar. Bill’s ear for great songwriting and honky-tonk authenticity earned them a reputation. With Michael on guitar, the band built a following on a circuit that stretched across Texas, Oklahoma, Colorado, and New Mexico. In 1979, they moved to Red River for a steady gig at the Alpine Lodge that lasted 12 years. It put them in the center of the small northern NM resort town’s remarkably vibrant music scene, an important outpost of a regional genre best described as Southwestern Americana. Michael Martin Murphey moved to Taos around the time the Hearnes moved to Red River. Hot off the Urban Cowboy craze and Austin’s “redneck rock” scene, Murphey had a number-one hit with “Wildfire” in 1975. He asked Michael Hearne to join the group that became the Great American Honky Tonk Band. Bill and Bonnie moved in 1992 to Santa Fe, where they built their own happy dance scene two nights a week in the bar at La Fonda on the Plaza. Bonnie retired in 2003, but the Bill Hearne Trio still fills the dance floor every Monday and Tuesday night. “I love what I do, and it’s still working,” Bill says. Meanwhile, South by Southwest was playing a monthly Wednesday night barn dance at Nat and Connie Troy’s Casa de Caballos horse facility near Arroyo Seco, north of Taos. It lasted deep into the 1990s, but finally outgrew the site. The Troys’ son-in-law, Mike Yaccino, was running their Old Blinking Light restaurant nearby, where Michael Hearne played solo every Monday night. Yaccino figured, why not revive the barn dances on the property outside the Old Blinking Light? In 2003, he helped launch Michael Hearne’s Big Barn Dance Music Festival, “where some of my favorite songwriters would come, and people would dance,” Hearne says. This year will be the 13th edition of the event. “I pick my favorite singer-songwriters from across the country, and I beg ’em to come,” Hearne says. He expanded his circle beyond the Southwest when he moved to Nashville in 2010 to immerse himself in the music-publishing business. Since 2012, he’s been based outside Austin, and spends much of his time performing throughout Texas and the Southwest with friend Shake Russell. Those gigs have brought countless new fans to the annual September Barn Dance. Fans appreciate the festival’s Taos setting. this year it will be in town. The all-weather festival is held under a big-top tent with state-of-the-art concert sound. There are even hot-air blowers: One reason the festival draws hundreds of Texans is that Taos can get chilly enough on September evenings for music fans to appreciate a good heater. Folding chairs bring the listening audience close to the stage while a small dance area in the rear stays busy nonstop. Performers from Texas, Nashville, and Memphis (past notables have included Butch Hancock, Jim Lauderdale, Ray Wylie Hubbard, and Delbert McClinton) are typically joined by a northern NM Who’s Who (including Busy McCarroll, Jimmy Stadler, and the Rifters). About 10 acts a day perform from early afternoon to 11 p.m. Thursday, Friday, and Saturday. This year’s roster includes Shake Russell, Trout Fishing in America, Susan Gibson, Bob Livingston, and Gary P. Nunn. The latter two were partners in two legendary groups, Michael Martin Murphey’s Cosmic Cowboy Band and Jerry Jeff Walker’s Lost Gonzo Band. When the seats go away for the finale, two-steppers fill the floor. After 10 years at Old Blinking Light, followed by two at Taos Ski Valley, the festival moves downtown this year to Kit Carson Park, two blocks from the historic Taos Plaza. Michael’s friends rallied this summer after learning that he’s been battling health issues; with their support, the event is expected to be at least as enthusiastic and energetic as usual. Ratón-based writer and photographer Tim Keller posts his work at TimKellerArts.com.